This lesson plan was designed by myself for an evaluation. It is an introduction to Chapter 3 of the textbook ISSUES FOR CANADIANS which is used in Alberta, Canada. 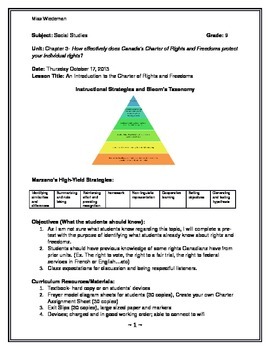 This chapter is all about individual rights and freedoms under the charter. If you haven't any clue where to start this chapter at, this lesson plan is ideal for you. 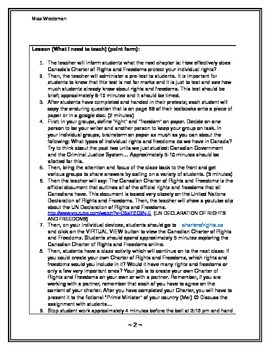 Sold separately is the assignment for the CREATE YOUR OWN CHARTER project- I just did this project with my grade nines and they really enjoyed it!